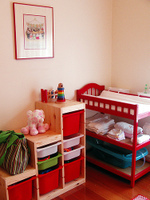 Red's usually a color that works great for children's rooms, but can be a hit or miss for nurseries. 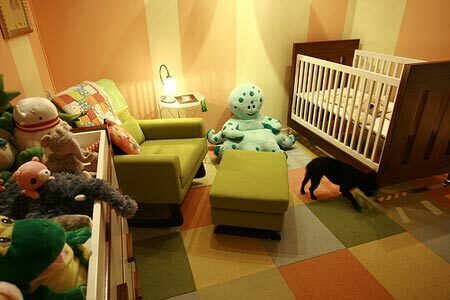 We always love to see a hit, so we were happy to find this nursery set on Flickr. Audrey's nursery uses red as an accent color (that's why we think it works so well) and a combination of pieces re-purposed and customized for the room. 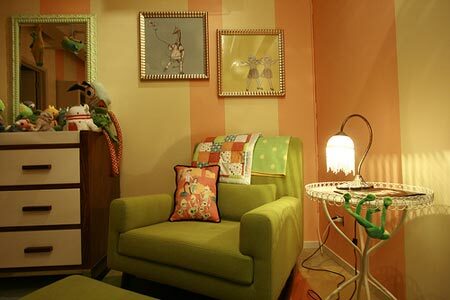 The antique Babar prints are from 1933 and found at an antiques home show. 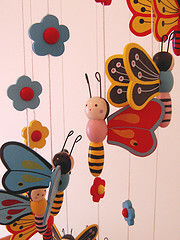 Also check out this great wooden butterfly mobile. We can't seem to find it available in the United States, but these two (Poppy's Toys, & Oodles of Toys online stores in the UK have them available for 11 pounds. SouleMama has inspired us to rethink the way we hang up art -- the use of embroidery hoops to hang up both embroidered art and fabric is both smart and inexpensive. It's especially great considering all the great fabric you may already have in remnant form. Definitely check out SouleMama and peruse her archives. It's a great crafting blog that has an emphasis on getting crafting with children. And, from her site, it appears her book, The Creative Family, is available for pre-order from Amazon. And to prove that it's really a small world after all, when we we checked out the Flickr set again during the course of writing this post, we realized that the room belongs to Jake, one of the Threadless co-founders!